Work by BNSF Railway to rebuild a railroad crossing in the Lakewood area will require full closure of a section of 172nd Street Northeast (SR 531) from 9 a.m. Monday, Nov. 28, through 5 p.m. Wednesday, Nov. 30. The closure surrounds the crossing near the intersection of 19th Avenue Northeast. Detours will be required and BNSF will provide signage. Passenger vehicles traveling eastbound will be detoured to Forty Five Road to 23rd Avenue Northeast to 140th Street Northeast (Fire Trail Road) to 136th Street Northeast to Smokey Point Boulevard to 172nd Street Northeast. Westbound passenger vehicles will take the same route in reverse. This detour is about nine miles in length. As Snohomish County has a weight limit on 23rd Avenue Northeast, trucks will be required to use a different detour. 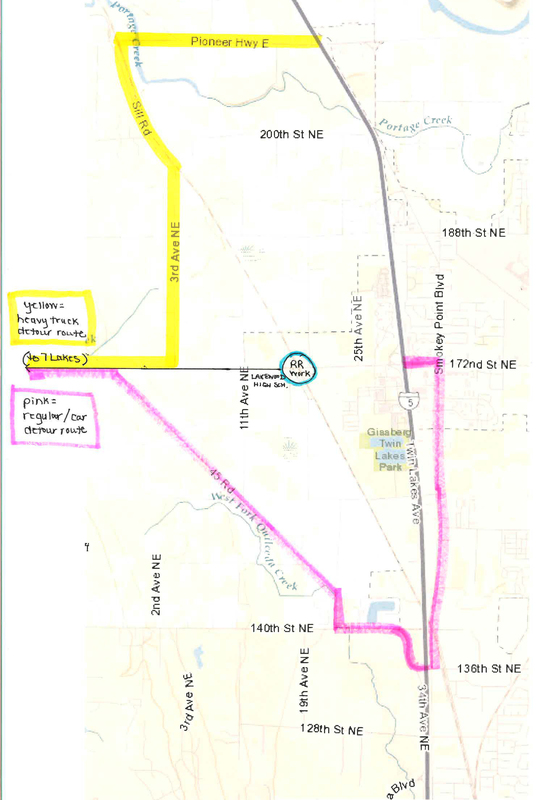 The eastbound truck route will go north onto 3rd Avenue Northeast to Sill Road to SR 530 to Smokey Point Boulevard to 172nd Street Northeast. The closure and detour are expected to significantly impact residents in the Lakewood area. About 14,000 vehicles daily use 172nd Street Northeast west of 19th Avenue Northeast. The Lakewood School District has about 2,300 students and 300 teachers and staff.